Repulse Bay is the most popular beach and swimming place in Hong Kong with convenient transportation. Here's how to get there. Repulse Bay in Hong Kong is actually one of the most visited tourist spots in the country. In fact, many tourists who are about to go on their package holiday deals often choose this place primarily because of its extreme and undeniable beauty. More than this, its location, which can be easily reached from any point of many vital institutions like airport, shopping centers, and other major advantages as well. Take a glimpse at the photos below and be stunned with what this resort has to offer. Repulse Bay is the most popular swimming place in Hong Kong with convenient transportation. Located in the south of Hong Kong Island, Repulse Bay is endowed with a pleasant seascape and charming vistas. Repulse Bay (named for a 19th-century naval battle) is the largest and most popular as it features changing facilities, showers and parking, as well as several bars and restaurants. Its barbecue facilities are extremely known with local families. 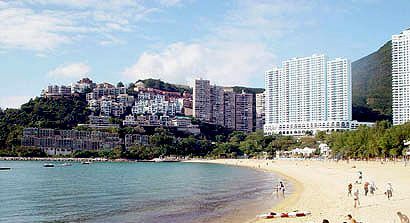 Repulse Bay is also has beautiful bay with its long line of coast and smooth sands. This means that the water quality of the Beach is good. To navigate Repulse Bay Map, use the controls in the top left hand corner. Please click to any markers below to see attractions view and information links. Repulse Bay is situated in the southern part of Hong Kong Island and there's NO direct access to the MTR trains. The most efficient way to get to Repulse Bay is by taking the public bus at the ground level of Central Exchange Square where you can find the Central (Exchange Square) Bus Terminus. Take the MTR trains that will get to the Hong Kong station and then take Exit D.